Clean, uniformed crews work quietly in your home or business. Protective “surgical style” booties worn to protect your flooring. Over 2 million dollars insurance protection for your peace of mind. At Sparkling Windows, there is no job too big or too small. Our “clean-cut” uniformed professionals can handle everything from residences to retail stores to entire industrial parks and shopping centers. Whether we are providing a service once a week or once a year, you can depend on us to be there. We are award-winning window cleaners with safety standards in place to protect our customers, their property and our cleaning technicians. We also provide the peace of mind that licensed, bonded and insured cleaners will be maintaining the appearance of your home or business. 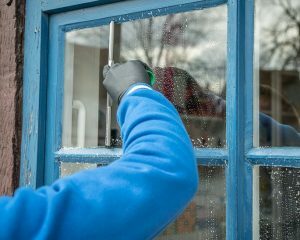 Click Here to read how best to prepare your windows so our Technicians can get your windows looking their sparkling best! Booking an appointment with us us quick and easy! contact us to book your appointment. Questions? Call us now: 856-200-8690 and we’ll be happy to assist you.